The Florida Highway Patrol Advisory Council is an organization comprised of business, professional, and community leaders throughout the state. Members of the Advisory Council provide assistance to the Director of the Florida Highway Patrol by offering input regarding the performance of the Patrol and the quality of service provided to the public. The Advisory Council was incorporated in 1999 as a not-for-profit 501(c)(3) organization and subsequently established the Florida Highway Patrol Trooper Memorial Fund. This fund was established to provide a memorial honoring Florida Highway Patrol Troopers and Florida Highway Patrol Auxiliary Troopers who lost their lives in the line of duty serving and protecting the citizens of the State of Florida. On an ongoing basis the fund provides financial and other support to the families of troopers and auxiliary troopers who lose their life or sustain life-threatening injuries in the line of duty. One hundred percent of the funding for the Advisory Council is through charitable contributions. Members also contribute many hours per year on behalf of the Advisory Council so as to insure that nearly one hundred percent of all financial contributions are supporting our troopers and their families. The Advisory Council does not participate in or sanction telephone solicitation. 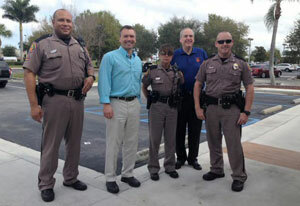 The Advisory Council assists the Florida Highway Patrol in other areas such as special projects, and undertakings designated by the Director of the Florida Highway Patrol. Especially important is the Council’s mission to provide our troopers with resources that will assist them with providing quality service to the public and enhancement of their personal welfare. 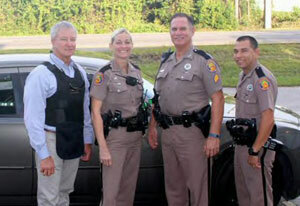 The experience, expertise and service of Advisory Council members contribute to the success of the organization and achievement of the goals of the Florida Highway Patrol.